Some crochet stitches appear more difficult then they may actually be, Staggered Shells I believe is one of these. 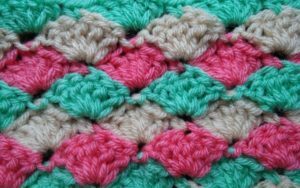 This stitch is essentially comprised of single crochets worked between shells that are made up of five double crochets. 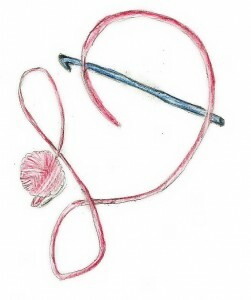 New crocheters sometimes do not realize that what creates a different look may simply be where you place a stitch, and that you can work more than one stitch in a location. However like all crochet stitches the name “shell” doesn’t tell you the entire story. “Shell” essentially means that there are a number of stitches worked in the same location, without looking at the Special Stitches section of a pattern there is no way to fully understand how this stitch is worked, what number of stitches, or which stitch for that matter is worked. For this shell pattern I have used five double crochets worked in the same stitch. Staggered Shells, changing color every row. I have written this stitch pattern out in an untraditional method to attempt to help in understand how to better read your stitches. In my teaching I have found that crochet can be very forgiving if you have learned how to read your work and not worry so much about counts. Seeing the pattern can free up your work (at the end of this post the stitch pattern is written in a traditional format). Row 1: To begin you create a chain that is a multiple of 5, then add 2 more chains. 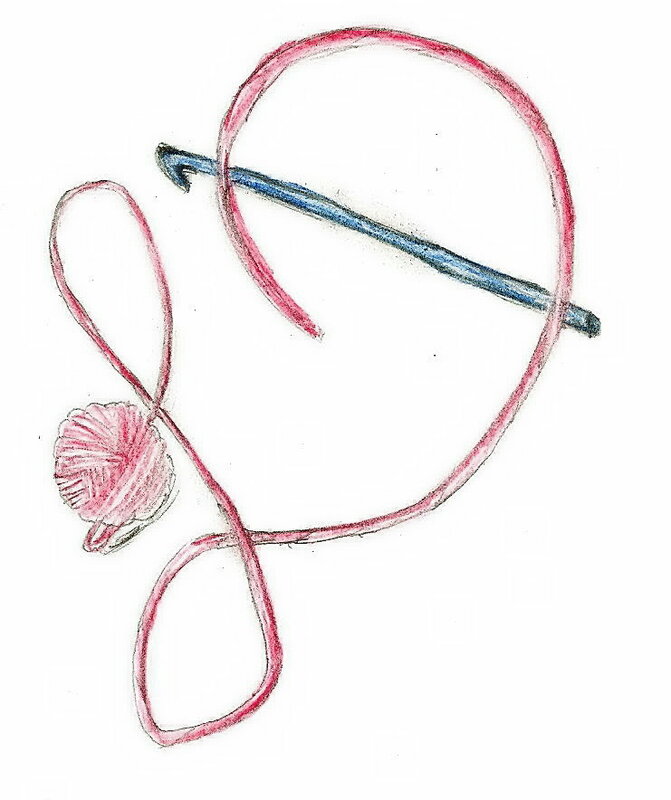 Single crochet in the second chain from the hook, [skip the next 2 chains, work a shell (5 double crochets) in the next chain, skip the next 2 chains, single crochet in the next chain] repeating everything in the [ ] across, turn. Row 2: Chain 3, 2 double crochet in the same stitch as the beginning chain, this creates a half shell at the edge of the fabric, work a single crochet in the center double crochet of the next shell, [then work a shell in the next single crochet (between shells), work a single crochet in the center double crochet of next shell] repeat everything in the [ ] until you reach the top of the last shell, after working the single crochet in the top of the last shell, work 3 double crochets in the last single crochet stitch (this is another half shell at the other edge of the work, turn. Row 3: Chain 1, single crochet in the same stitch, [shell in the next single crochet, single crochet in the center double crochet of the next shell] repeat in the [ ] across, turn. Repeat Rows 2 & 3 until it is the desired length. Row 1: sc in 2nd ch from hook, [sk 2 chs, shell, sk 2 chs, sc] repeat across, turn. Row 2: Ch 3, 2 dc in same st, sk 2 dc, sc in next dc, [shell in next sc, sk 2 dc, sc in next dc] repeat across, 3 dc in last sc, turn. Row 3: Ch 1, sc in same st, [shell in next sc, sk 2 dc, sc in next dc] repeat across, turn. Repeat Row 2 & 3 until desired length.